We often get asked by our campervan hire customers what they should bring with them. So we’ve pulled together the below list of essential items to take on your next campervan adventure. 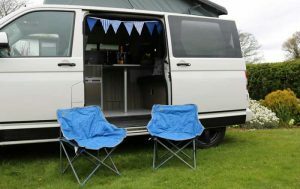 Depending on where you hire your campervan from, it will come with varying degrees of camping equipment as standard. At Devon Camper Hire, we provide enough basic equipment to cook a decent fried breakfast, enjoy a brew and relax with a glass of wine or cool drink. What better way to end a long day in the ‘wilderness’? We also provide two fold up camping chairs as standard, a blanket and 2 cushions. 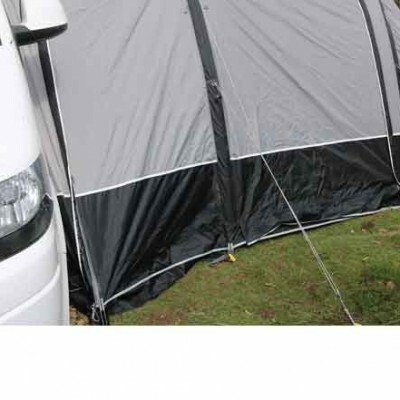 You can see a full list of our standard camping equipment here. So, let’s just say you’re hiring your campervan from us and you have all the basic equipment covered, thanks to our good selves. What else should you bring to make your campervan adventure that little bit more comfortable? If you have your own sleeping bags we always recommend you bring them, along with a couple of pillows. We can provide bedding at an additional cost and if it’s just 2 of you it can make sense. However, the double duvet and pillows we provide take up quite a bit of space. If a family of four has two sets of bedding between them, things can get quite ‘cosy’ quite fast! Sleeping bags take up far less room and it’s much more convenient to stuff them in their bags and throw them out of the way somewhere during the day. We learnt very quickly the importance of having something to use as a bin. 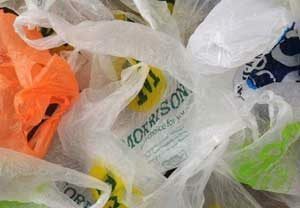 Bring a handful of used carrier bags, as you’ll be surprised at the amount of waste you generate. Second-hand carrier bags are great because you can use the handles to hang them up. You’ll also be doing your bit for the environment by getting more than a single use out of them. David Attenborough would be proud of you! Although there’s plenty of lighting in our campervans, some sites are not that well lit at night. It’s always a good idea to bring a couple of torches, meaning two of you can go on separate night time visits to the shower block at the same time. There’s nothing worse than sitting with your legs crossed, waiting for the torch to come back from the shower! A washing up bowl is also really useful for storing and carrying dirty dishes and draining the clean dishes. 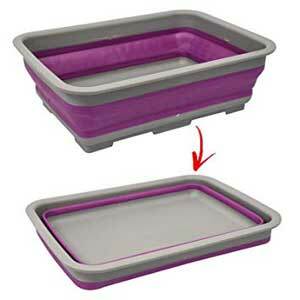 You can get some great camping washing up bowls that collapse down for efficient storage, like the one pictured. Yes, there will be a cooker of some description in your camper. This is perfect for making a brew, and cooking a meal when the weather’s being all ‘UK’ on you. But you simply can’t beat cooking in the great outdoors (weather permitting!). You could simply opt for a disposable BBQ and bring a spatula and tongs from home. But make sure you check whether disposable BBQs are permitted where you’re staying. If you wanted to opt for a less disposable option, there are plenty of decent portable BBQs on the market, like the one pictured, for not a lot of money. And you’ll get plenty of use out of it afterwards, on family picnics and back garden cook-ups. 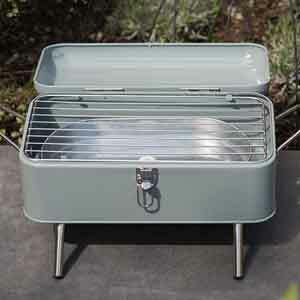 Some campers come with a built in grill for making toast and the like but most don’t. We did have a customer who hired one of our campers and she couldn’t function without her cuppa and slice of toast in the morning. So we provided her with a stove top toaster, like the one pictured. 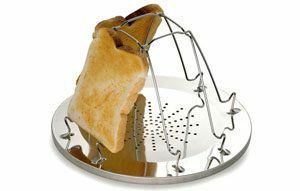 The base sits on one of the gas rings and you arrange your bread around the upright wire frame. The heat from the gas flame then toasts the bread nicely, one side at a time. You could make tea and toast, should you wish, from the comfort of your very own bed! 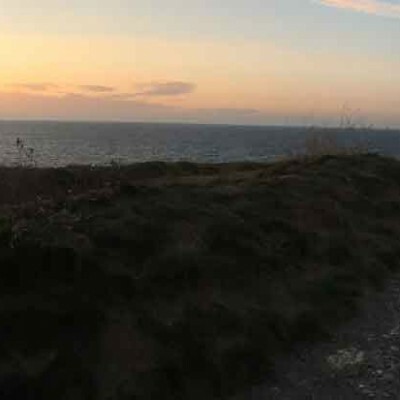 A few basic provisions can make a massive difference to comfort levels when getting back to nature in a campervan. By taking a little time to prepare properly, your adventure in the Great Outdoors will be an absolute breeze!